This test will examine the area of interest using a magnetic field. There are no known health risks from using this magnetic field to make images. You will lie on a special table that slides into a short tunnel. If you are claustrophobic, notify your doctor. Your doctor may prescribe medication to ease your anxiety. You will hear loud, knocking sounds during the exam, but you will not be able to feel anything. You will be able to talk to the technologist through a microphone. If you like, you may bring your favorite CD to listen to during the scan. Follow any instructions you were given to prepare for the test. You may take your normal medications. You will be asked to fill out a questionnaire to let the technologist know if you have a pacemaker, have ever had surgery to the area of interest, or have had heart or brain surgery. We must know if you have ever had metal in your eyes. If so, we will perform a set of x-rays of your eyes to confirm your eyes are free of foreign bodies. This is for your safety. Depending on the test ordered, the technologist may inject contrast, which contains no iodine, into a vein in your arm. 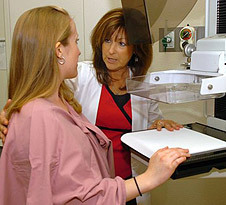 A registered technologist will make a set of images for the radiologist. A radiologist is a medical doctor that specializes in x-rays and other imaging tests, including MRI. The radiologist will interpret your images. It will take approximately 2 days for your doctor to receive the final report. You will receive the report from your doctor. Please arrive 30 minutes prior to your appointment time. Before entering the MRI scanning room, you will be asked to remove watch, jewelry and other metallic or magnetic objects. For this reason, we suggest that you dress in comfortable loose fitting clothes with a minimum of metal (sweat pants, t-shirt or sweat shirt). You will also be asked to remove your bra because of metal hooks or snaps. Although the MRI exam is painless, it does require the patient to lie still for extended periods of time. Cancellations are sometimes unavoidable, but it is important for you to notify us a day in advance. This courtesy allows us to make arrangements for other patients. To cancel or reschedule an appointment, please call 764-5050, then select option 1 to speak with a scheduling representative.